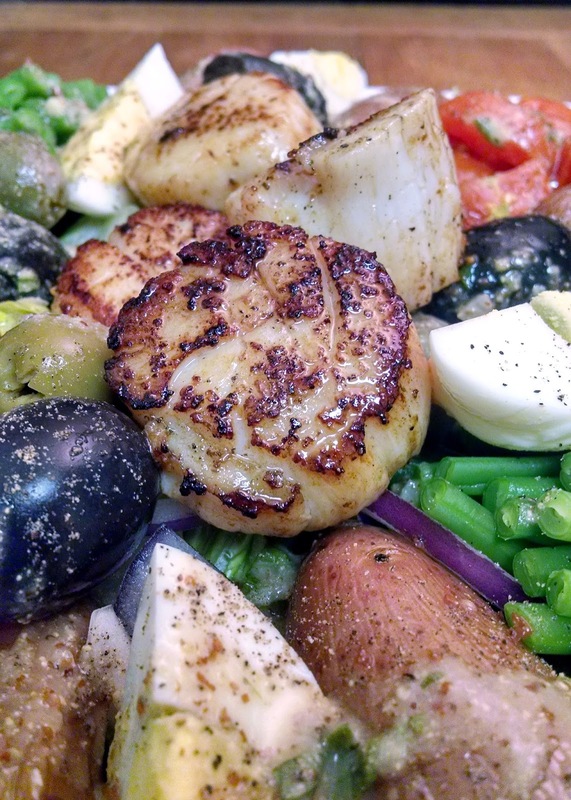 Swap out the tuna for some pan seared scallops in this Scallop Niçoise Salad. Prepping the ingredients before hand makes this salad some together in a snap any night of the week. It also gives the ingredients time to mellow in flavor or marinate if you toss them with the dressing. 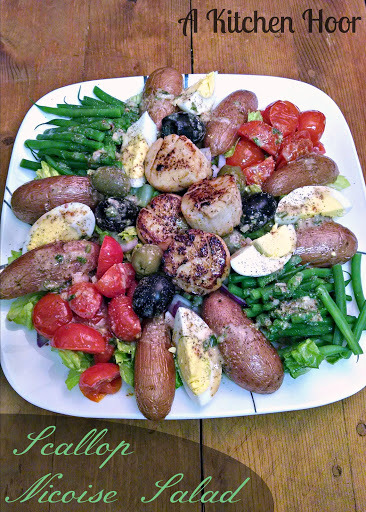 S is in love with scallop salads. Since I have made sweet and tangy salads the last few weeks, I thought I’d do something different for this week’s salad. I really all the heartiness of a Niçoise salad. The green beans, potatoes, tomatoes, olives, eggs, lettuce, what have you. Yes, it’s a bit of a pain and does require some prep, but I’m starting to really get into prep work on the weekends. It makes the weeknight meals easier and faster to prepare. The prep for this is pretty easy. I bought some fingerling potatoes and thought I’d roast them instead of boil them as is typical with this salad. I roasted them until they were just slightly less than fork tender. I knew they would continue to cook and I didn’t want them to be mush when I sliced them in half. I halved the cherry tomatoes and roasted those bad boys, too. If you have never roasted cherry tomatoes, for whatever reason, you really should. If you’re doing a spaghetti sauce, roast some, chop them up, and throw them in your sauce. They’re super sweet and oh so tasty! I boiled the eggs and blanched the green beans. Then I whipped up the dressing. This was Sunday. It all rested in the fridge until Tuesday. 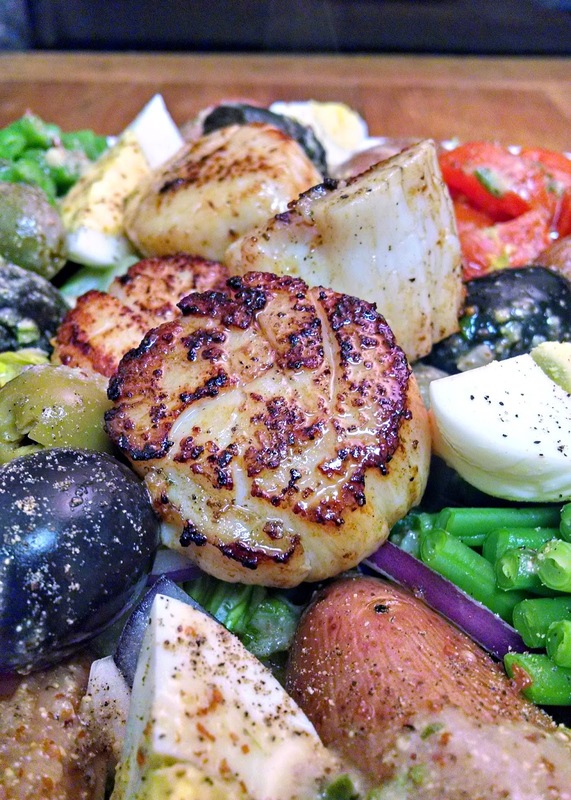 All I had to do Tuesday was assemble the salad and sear the scallops. How difficult is that?? It’s amazing how diverse your meals can be with just a little prep work. Plus, it makes weeknight meals quick and tasty. As you can see, it’s QUITE a hefty dinner. This is how I arranged the ingredients before I cooked up the scallops. I tried to make it pretty and not too big. It’s quite a meal without the scallops, but S loves those scallops. And, well, I do, too! They’re a bit pricier than shrimp, but they are really tasty. I mean just look at that seared goodness there!! Scallops are a bit finicky to pan sear. You have to watch them like a hawk or they will over cook quickly. I keep touching mine to see when they’re just about done. Depending on what I have left to prep for dinner, I may take them out sooner rather than later. If all I have to do is plop them down on the salad like this one, then I took them out later. In the case of the wilted salad, I take them out sooner so the residual cooking heat doesn’t over cook them, but simply cooks them until done. It’s kind of like cooking a good fillet; you just keep touching it to tell when it’s done perfectly. I do hope you don’t let their finickiness deter you from making this tasty salad! Coat the potatoes with 1 teaspoon extra virgin olive oil and roast until almost fork tender. Remove from heat and cool to room temperature. Refrigerate overnight. Place the cherry tomatoes, cut side down, on a baking sheet lined with aluminum foil coated with cooking spray. Bake 10 to 15 minutes or until tender. Remove from heat and cool to room temperature. Refrigerate overnight. Bring a large pot of water to boil. Add the green beans and cook 3 to 5 minutes or until crisp tender. Remove from heat and refrigerate overnight. Combine the olive oil, mustard vinegar, tarragon, shallots, sea salt and black pepper in a small bowl. Cover and refrigerate overnight. Divide the lettuce mix evenly among 4 plates. 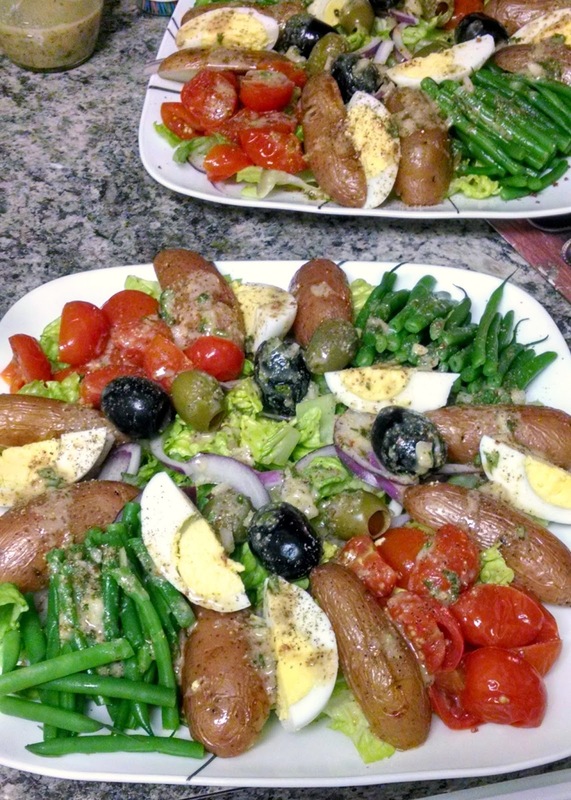 Arrange the potatoes, roasted cherry tomatoes, green beans, hard boiled eggs, red onion, and kalamata olives evenly on each plate. Heat a large skillet coated with cooking spray over high heat. Add scallops and cook 3 to 5 minutes on each side. Remove from heat and divide among the 4 plates. Stir dressing slightly before drizzling over top of each salad.